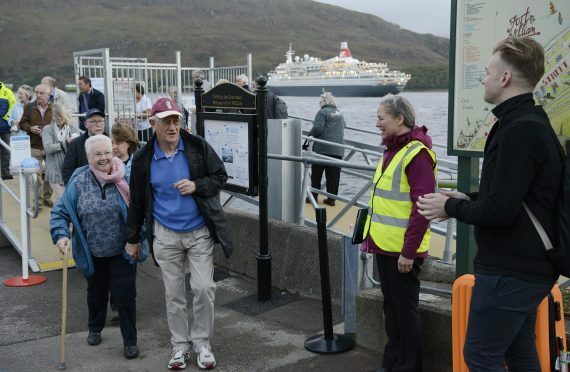 Fort William’s new pontoons were used by cruise ship passengers for the first time yesterday . Fred Olsen Cruise Lines’ Boudicca – with around 880 passengers and 320 crew on board – moored in Loch Linnhe early yesterday morning before the visitors were brought ashore. The £170,000 pontoons were installed by Fort William Marina and Shoreline Company (FWMSC) after a cruise company had serious difficulties bringing disabled passengers ashore from a liner moored in the loch last year. They have been in use since June and were officially opened by Culture Secretary Fiona Hyslop earlier this month. But the 674ft Boudicca was the first cruise ship to make use of the new facilities, which include a new information board and a recently erected £15,000 shelter for passengers waiting for buses to take them on excursions. FWMSC secretary Sarah Kennedy said the visit had gone extremely well and they were very hopeful that the passengers would give the Lochaber town good feedback. She said: “It was a fantastic visit and everything went very smoothly, despite the rain. “Everybody was delighted with the pontoon facilities and the bus shelter. Members of Fort William Town Team and students from West Highland College UHI handed out maps and leaflets to the visitors and gave them directions to wherever they wanted to go. And a full programme of entertainment and activities was laid on for the visitors. The Boudicca is booked to pay return visits on May 10, May 27 and July 18 next year, and the Braemar is due to visit on May 25, with the Black Watch scheduled for June 15 and August 18. They are all Fred Olsen vessels. FWMSC is now planning a £750,000 extension to the pontoons to create a 24-berth marina-like facility.